The only way to follow one beloved race track is to head straight to another a week later. Belgium might not have served up an instant classic this time around - the heart-in-the-mouth first-corner crash the only real talking point - but Sebastian Vettel's fifth win of the season is still enough to keep the hunt for the championship alive and well heading into the formidable Italian Grand Prix. Daniel Ricciardo summed up Monza best when he said: "The fans are nuts, typical Italians. Very passionate." If you search the crowds for another team's colours you'll be out of luck. The sea of red, yellow and black is as dominant as the green, white and red of the Italian flag. Climbing over barriers, sporting painted faces and fancy dress, setting off vibrant red flares in the middle of the crowds; only the craziness of the Japanese contingent at Suzuka can match the hero worship the tifosi puts on display. 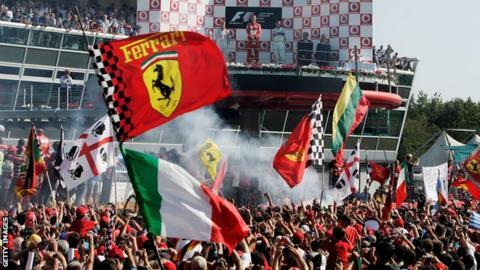 And if there's one thing guaranteed to get the Italian masses hot under the collar, it's a Ferrari victory on home soil. As one of the longest running events on the current calendar, this 5.793km circuit has seen it all. Michael Schumacher still holds the record at 'La Pista Magica' with five victories between 1996-2006. During his post-race news conference in 2000, the seven-time world champion stunned fans when he broke down in tears after equalling Ayrton Senna's tally of 41 wins. It was a sight the F1 world had never seen before; even Schumacher himself once commented: "I'm probably too German for a lot of the tifosi. Too serious, not enough ups and downs, not enough emotions. People love that, particularly in Italy." This time, however, his emotions spilled out for all to see, consoled on either side by McLaren's Mika Hakkinen and brother Ralf in third for Williams. Fast forward six years and it was Monza where Schumacher chose to announce he was retiring from the sport following his 90th career triumph. Taking to the podium for the beginning of his long goodbye, the congregation gathered below to savour the moment with a racing legend. He may have had to work a little harder for the Italian love than some of the other Formula 1 greats but, in the end, the fanatical tifosi got what they wanted: a Ferrari icon on their turf. Now it's the turn of another German world champion to use the Monza magic to his advantage. With a championship deficit cut to 17 points following victory at Spa, Vettel has the opportunity to win back-to-back races for the second time this season. After Lewis Hamilton expressed his concern about Ferrari's pace advantage, will the unmistakable radio message of "grazie, grazie. Forza Ferrari" be ringing in the air at the drop of the chequered flag? Three seems to be the magic number at the Italian Grand Prix. Since 1953, six drivers have recorded three race wins each at the legendary Monza circuit. To help you in your quest in gaining top marks, we've provided some handy hints and bits of trivia for every answer. Naturally, there are three minutes on the clock to crack this one. In 1454, a real human chess game took place in Marostica, Italy, with the winner awarded the hand of Lionora, daughter of the ruler Taddeo Parisio. To commemorate the event each September in even-numbered years, the town's main piazza becomes a life-sized chess board. In 2014, WhatsApp was cited in nearly half of Italian divorces. Forty percent of marriages that hit the rocks claimed the free messaging service played a role in the break-up, with a leading Italian divorce lawyer saying it encouraged the return of the 'Latin lover'. The mayor of Falciano del Massico, a small town in southern Italy, banned its residents from dying after declaring the local cemetery was full. The 3,700 citizens had to travel several kilometres down the road to attend a funeral or to be buried. The surname Ferrari derives from the Latin word "ferrum" - which means "iron" - and was an occupational surname for blacksmiths. In Italy, Ferrari is basically the English equivalent of the last name Smith.